I made a long delayed visit to the North East this week. As you may know, it is a significant contributor to our Schools business, and Rajiv Singh and his team are doing a great job of establishing Pearson as the premier school publisher in the region. I would urge many of you in support departments to visit the team, and get a better understanding of the rather unique challenges they face - from IT, to Customer Service, to HR. Naveen and I visited Guwahati, Dimapur, Kohima and Tura on this visit. In fact I am writing this on the drive from Tura to Guwahati, while in the middle of the breathtakingly beautiful Garo Hills. Rajiv claimed that you can open the school bag of any primary school kid in the state and you will find a Pearson book. This is logical, since we publish on behalf of the state board, but its illustrative of the difference in the scale of what we are doing here, and in many other parts of the country. Here, something like 600,000 students are learning English from a Pearson book. Cynic that I am, I asked Rajiv to stop at a small government school we passed - three classrooms, one teacher. Now we have photographic evidence of the truth of his statement. What do you do when you have over a lakh books in the warehouse and space is at a premium? You can pulp them; and at the pitiful, peanut-like sum of 8 rupees a kilo, you might stand to make a few thousand rupees. Or you can give them away, for nothing, and the smiles of a few young readers might not do much for your bank balance, but it does give you an awfully good feeling. If you like feeling warm and mushy inside, of course. In June 2008, Pearson Education, India, sent a few truckloads of books to Varanasi. It was the culminating step of many meetings and discussions and a lot of hard work on the part of some people. And it was the first step towards literacy for hundreds of kids who had rarely had the chance to touch, let alone own, new and unused books. 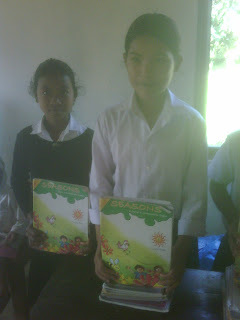 Some of these books were distributed among schools funded by a programme called World Literacy of Cananda [WLC]. Some of the books went to a mobile library, a rural library and a community library supported by Rotary Club International. One lakh sixty thousand books were distributed among forty schools. And of all the pictures that I saw from that episode, I really liked this one below. The sight of three kids on a bench, sitting and reading very earnestly tells you nothing, until you put it in context. And the context here is a centre dedicated to kids suffering from mental or physical disabilities. It’s just a drop in the ocean. Giving out a few lakh books, in a country where millions of kids don’t get a fair chance at education, is just one step on the long road to total literacy. This year, Pearson Education is reaching out to kids with a donation of over 3 lakh books to the Bakul Library Foundation. The Bakul Foundation has big plans, which include setting up community libraries for slum kids and organising mobile libraries to reach out to rural areas. At the same time, they have some valid concerns. The biggest challenge, according to Sujit Mahapatro from Bakul, will be to ensure that these books actually benefit the children who receive them. To this end, they are planning to mobilise volunteers to engage the children’s interest in reading books in English. And the first step of this initiative was taken on 30 September in Bhubaneswar when internationally-acclaimed actor and director, Nandita Das announced the book giving as part of the celebrations of the Joy of Giving Week in India. On the right, there’s Ms Das. And beside her, a kid engrossed in a book, oblivious to the star and the clicking cameras. Now that’s something you don’t see everyday! But the event in question wasn’t a run-of-the-mill show either. 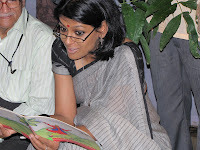 As the children (and the adults present) listened enthralled, Ms Das enacted a Gujarati folk tale. After giving away some of the books donated by Pearson to the students from the Madhurmayee School for Children of Convicts, she also spoke to the media on the importance of giving as a part of our social responsibility. Social responsibility…corporate responsibility…these are big words. At the end of the day, the smile on a kid’s face says it all. Post script 1: In case you were wondering who the nameless faces behind the donation were, here’s the list of acknowledgements. The donation was made possible by Vivek Govil and Dipankar Bose (the latter ensured that the entire process went off without a hitch). Naveen Rajlani, Prashant Rathore and the Orissa school sales team stepped in on the day of the event to take care of some last-minute emergencies.